A Lazair Series III with its bottom-mounted control stick. This one has been modified with a streamlined pod and windshield. The engines are the Rotax 185 9.5 hp two-stroke powerplants driving “biplane” propellers. A Lazair Series II displays the very long wing which gives this aircraft good gliding performance. This aircraft has been modified with conventional aircraft fabric and wider main landing gear. A Lazair II two-seat trainer with its JPX PUL 425 engines of 26 hp (19 kW). 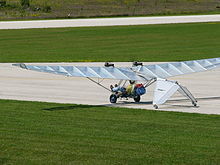 The Ultraflight Lazair is a family of Canadian designed and built twin-engine ultralight aircraft that were sold in kit form between 1979 and 1984. With a total production of over 2000 aircraft delivered the Lazair series is the most produced Canadian-designed aircraft. The designer of the Lazair, Dale Kramer, was an aeronautical engineering student at the University of Toronto when he attended the Oshkosh EAA convention in 1977. He was very impressed with the potential of the ultralight aircraft designs that he saw there and returned with a Superfloater glider kit. Convinced that improvements to the design were possible, Kramer started with a blank sheet of paper and designed a completely new aircraft, even going so far as to design a custom airfoil for it. The design features a constant taper wing with a progressive and constant washout from root to tip. Combined with an airfoil that is cambered with concave portions on both the top and bottom surfaces, this produced an aircraft with optimized low-speed handling and very gentle stall characteristics. The wing is constructed from an aluminum "D" cell leading edge, foam ribs and an aluminum tubular trailing edge. The aircraft also featured some of the first winglets used on light aircraft. The very long wing made the Lazair a good glider, giving it a 12:1 glide ratio, and it could be soared in even light thermal conditions. Kramer named the aircraft “Lazair” as a contraction of “Lazy-Air”, a comment on the slow cruise speed of the aircraft, which was about 40 mph (64 km/h). Initially Mylar was used as a covering on the wings and tail, attached to the airframe with two sided tape. After the Mylar proved to have a short service life due to UV damage, it was replaced by a more expensive product, Tedlar. For control run simplicity the control stick pivot point was located above the pilot with the stick hanging downwards. The ailerons and ruddervators on the inverted V-tail were interconnected so that turns were made with connected rudder and aileron by moving the stick to the side. Pitch control was via conventional fore-and-aft stick movement moving the ruddervators together as elevators. Because Kramer could not find a suitable engine for the design that provided the needed power with reliability, he opted for two engines instead, placed as close together as possible to reduce yaw when one failed. The entire concept was to produce an aircraft that would fly with minimum power and so the prototype had two chainsaw engines that produced a total of 11 hp (8.2 kW). The first Lazair prototype was constructed by Kramer and his friend and associate Peter Corley and first flown in 1978. Kramer formed Ultraflight Aircraft to produce the design in his home town of Port Colborne, Ontario. Sales commenced in 1979 through the subsidiary "Ultraflight Aircraft Sales". The first Lazairs were originally marketed just under the model name "Lazair", but were later termed “Series I” after improved models had appeared. The initial model Lazair was a single-seater with a 36.3-foot (11.1 m) wingspan and was powered by two 5.5 hp 100 cc Pioneer chainsaw engines, directly driving plastic propellers in tractor configuration. The main landing gear used 16-inch (410 mm) wheels with a track of just 26 inches, which combined with the long wing span, meant that taxiing in more than 7 mph (11 km/h) of wind required a wing walker. Tail skids were fitted to the inverted V-tail. There was customer demand for putting the Lazair on floats, but this required more power than the Pioneer powerplants could develop. The solution was to substitute 9.5 horsepower (7.1 kW) Rotax 185 engines. These single-cylinder engines were used extensively in forest fire fighting water pumps and had proved reliable in that application. The propellers were the same plastic units used on the Series I with its 5.5 hp (4.1 kW) engines. To absorb the greater power two propellers were stacked to form a “biplane propeller”. This was done because Ultraflight had ample supplies of the existing propellers and using them saved money over developing a new propeller. During the production of the Series II the tail skids were replaced with tail wheels and later on, swiveling wheels. Skis were also available, although open cockpit flying in the winter could be a challenge. Rudder pedals were introduced which allowed side slipping of the aircraft as well as crosswind landings. The rudders could be coupled to the ailerons or de-coupled and controlled by the pedals in flight through a mixer gear. Power on the Series III is still provided by two 9.5 horsepower (7.1 kW) Rotax 185 engines with the option of a pair of KFM 25 hp (19 kW) or JPX PUL 425 26 hp (19 kW) engines. The Lazair Elite is a limited production aircraft that includes a structurally strengthened airframe and an enclosed cockpit. It is suitable for heavier pilots. The Lazair II is a two-seater trainer with the seats in side-by-side configuration. It was introduced in 1983 and 50 were completed. The Lazair II is powered by two JPX PUL 425 engines producing 26 hp (19 kW) each. The engines are more widely spaced than on the single-seater models which gives it vastly different single engine handling characteristics. With one engine at full power and the other shut down it descends faster than with both engines off. The “SS” is the “Surveillance Special” which was designed for police use, which included the Elite airframe and the JPX PUL 425 engines of 26 hp (19 kW) each as used on the two-seat Lazair II. Lazair SS aircraft were employed by the Monterey Park Police Department in California. In 2011 Lazair designer Dale Kramer introduced an experimental electric-powered Lazair on an amphibious mono-float, with outrigger floats at AirVenture. The aircraft is powered by twin Joby JM1 powerplants with Jeti SPIN Pro 300 controllers and dual 16 cell 4 amp-hour battery packs that produce 63 volts, mounted in the wings. The aircraft won Antique Ultralight Champion and Best Ultralight Amphibian at AirVenture. The aircraft is an experimental project and no production is planned. Lazair production commenced in 1979 and was completed in 1984, the company citing “liability concerns” and the resulting cost and availability of insurance as the reason. The aircraft were widely sold in Canada and the United States and sales totaled more than 2000, making the Lazair the most produced Canadian aircraft design. The Series II Lazair was the most produced individual model. The Lazair inspired many other aircraft designers to use the Lazair wing construction techniques. The Blue Yonder Merlin is one aircraft that uses a wing based on the Lazair wing. In Canada all Lazairs are classified as Basic Ultra-lights. A multi-engine rating is not required to fly the Lazair in Canada as there is no multi-engine rating for ultra-light aeroplanes. In the USA the single-seat models are flown as ultralights under FAR 103, whereas the Lazair II two-seat models are usually registered as experimental amateur-builts. In the 21st century many Lazairs are still in use by private owners. As when first introduced, they remain prized for their handling qualities, if not their cruising speed. In November 2007 the Canadian register still carried a total of 460 Lazairs of all models. In the USA where the majority of Lazairs are flown as unregistered FAR Part 103 ultralights there were also ten registered as amateur-builts in November 2007. ^ a b c d e f g h i j k l m n o p Hunt, Adam & Ruth Merkis-Hunt: Skeletal Remains, pages 64-70. Kitplanes Magazine, September 2000. ^ a b Hunt, Adam & Ruth Merkis-Hunt: Poised to Fly, pages 76-83. Kitplanes Magazine, October 2000. ^ a b UL Flyer (n.d.). 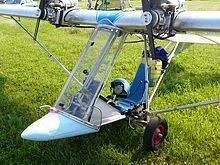 "Lazair: A Classic Ultralight Twin". Retrieved 2007-10-31. ^ a b c Hunt, Adam & Ruth Merkis-Hunt: Test Flying Lazair No. 1, pages 98-106. Kitplanes Magazine, December 2000. ^ a b c National Air and Space Museum (1998). "Ultraflight Sales Lazair SS EC". Archived from the original on 2007-10-10. Retrieved 2007-10-31. ^ Lazair.com (n.d.). "Lazair.com". Retrieved 2007-10-31. ^ a b c d Lazair Force (n.d.). "An introduction to the Lazair". Retrieved 2007-10-31. ^ Transport Canada (April 17, 2007). "Ultra-light Aeroplane Transition Strategy". Retrieved 2007-11-04. ^ a b Federal Aviation Administration (November 1, 2007). "FAA Registry Make/Model Inquiry Results". Archived from the original on July 23, 2011. Retrieved 2007-11-01. ^ Transport Canada (November 1, 2007). "Canadian Civil Aircraft Register". Archived from the original on May 3, 2008. Retrieved 2007-11-01. Wikimedia Commons has media related to Ultraflight Lazair. This page was last edited on 16 November 2018, at 14:03 (UTC).